The 90 years old heritage property of Haveli Hari Ganga is ranked amongst the best Haridwar hotels. Haveli Hari Ganga is an irresistible blend of old world charm with modern hospitality. Associated with the Leisure Group of Hotels, it is one of the best luxury hotels in Haridwar by Prasad Heritage Group. The interiors of The Haveli are captivatingly evocative of Indian mythological times. It is situated on the banks of sacred Ganga River at gateway of - The Abode of Gods in Haridwar. 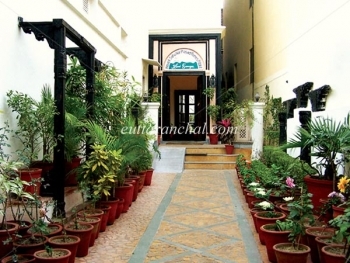 Haveli Hari Ganga of Leisure Hotels, is a peaceful and luxurious hotel with traditional hospitality. The hotel hosts a multi cuisine restaurant, satsang bhawan, air conditioned rooms and several other facilities. The Haveli Hari Ganga, a beautiful heritage Haveli is situated on the banks of the Holy Ganga river, a mere 500 meters walk through the Bazaar from the sacred Har ki Pauri at Haridwar. Mansa Devi Temple is 2 Kms from hotel. Haridwar Railway Station and Bus Stand are 1 km from hotel Haveli Hari Ganga. There are 14 Superior and 6 Suiterooms in Haveli Hari Ganga. 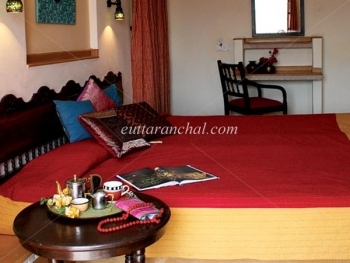 All the rooms are well equipped with modern amenities and artistic interiors. Indulge yourself in the royal pleasures of 90 years old heritage hotel, Haveli Hari Ganga. Most of the rooms are decorated with antique arabesque, regal beds made of stone and matching upholstery. All the rooms are air-conditioned, intercom, Color T.V. and tea/coffee maker. All the rooms have attached toilet and bath with running hot and cold water. All the deluxe rooms are situated in quite locations within Haveli with spacious living area. Superior rooms are facing the holy Ganges with a large sitting area. The multi cuisine vegetarian restaurant of Hotel Haveli Hari Ganga serves mouth-watering food. The coffee shop serves refreshing beverages and tempting snacks, giving fantastic treats to the travellers. Enjoy sumptuous dishes at Haveli Hari Ganga to lose yourself to a delightful culinary escapade like never before. - Private Rickshaw transfers, Safe Deposit Lockers, EPABX enabled telephone facility, T. V.
All the rooms of the hotel Haveli Hari Ganga affords such great charm it will be difficult for you to leave your room. But the hotel and its vicinity has a lot more to offer. Take a holy dip in the sacred Ganga River, visit different temples having immense religious importance and rhyme to the invigorating tune of the evening aarti. Haveli Hari Ganga hotel transforms the religious tour of Haridwar into an extraordinary experience. There numerous recreational activities offered by Haveli Hari Ganga. You can have a session with the astrologer, massage at the ayurvedic health spa is also available, you can also be a part of yoga and meditation camps, evening aartis and sightseeing tours are also organised by Haveli Hari Ganga. - Steam Bath, Escorted visit to Har ki pauri during evening Aarti. - Bhajan Sandhya, Daily Havan at the Sanjivini (Hotel Private bathing Ghat) in the morning. - A Complimentary Session with Palmist/Astrologer. The Haveli Hari Ganga hotel is 220 Kms from New Delhi, 20 Kms from Rishikesh, 30 Kms from nearest airport in Dehradun.